Be the first to share your favorite memory, photo or story of Eugie. This memorial page is dedicated for family, friends and future generations to celebrate the life of their loved one. 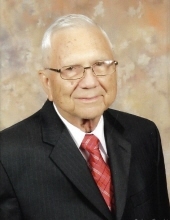 Eugie Louis Hoos of Miami, OK passed away April 14, 2019 at the age of 91 in Springfield, MO. He was born on March 5, 1928 in Porum, OK to John and Cora (Todd) Hoos. He married Elva on February 11, 1950. Eugie grew up in Checotah, OK. He served in the Army from 1946-1949. He worked to rebuild areas in Europe destroyed during WWII. Eugie loved learning and pursued several different degrees and certifications which allowed him to teach high school business. He left classroom work to pursue a position in administration. He retired from Miami Public Schools after serving as a elementary principal for many years. He was admired for his traditional pedagogy where he was loved and revered by all students. Eugie served as a deacon at First Baptist Church where he and Elva were active members for many years. Eugie was a hard-worker and loved to grow vegetables and flowers in his yard and garden. He is survived by his daughter-in-law, Julie Shipley-Hoos of Springfield,MO. His three grandchildren, Trevor Shipley (Stacy) of Madison, MS, Ryanne Hoos of Springfield, MO, and Mallory Hoos (Garry Hancock) of Liberty Township, OH, and his 3 great grand children, Madeline, Declan, Lorelei and several nieces & nephews. He will be missed by his family, friends, and neighbors. Eugie was preceded in death by his wife, Elva, son, Dr Gary L. Hoos, and his great-grandson Liam Shipley. We would like to thank Dr. Wiggins at Mercy Hospital, Springfield, MO and Dr. Kelly at VA Clinic in Springfield for their amazing care. Funeral will be held at 10:00 on Saturday, April 20, 2019 at First Baptist Church in Miami, OK. Services have been placed in the care of Paul Thomas Funeral Home and Cremation Service of Miami, OK.
To send flowers or a remembrance gift to the family of Eugie L. Hoos, please visit our Tribute Store. Guaranteed delivery before Eugie's service begins. "Email Address" would like to share the life celebration of Eugie L. Hoos. Click on the "link" to go to share a favorite memory or leave a condolence message for the family.